The genuine look of hardwood is easy to install and affordable with this oak laminate. It is durable and installs with a simple locking technology. Give your rooms a rustic touch that won't fade, scratch or stain. 15.04 sq. ft. per case, case weight: 32 lb. Buy online Pennsylvania Traditions Oak 12 mm Thick x 7.96 in. Wide x 53.4 in. 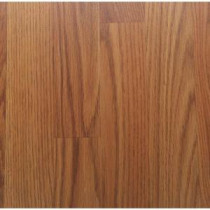 Length Laminate Flooring (15.04 sq. ft. / case) 367871-00237, leave review and share Your friends.